Customer Relationship Management – a foundation for our business…. I am so relieved that I had the discipline to start my CRM system a couple of years ago; I cannot imagine managing the connections I have been building through the 1500 meeting I have had in the past 2 years about The Business Cafe. So this is my Thought for the Day. Last week I talked about Cash flow. I think these two disciplines are what keep me sane at the moment. Awareness of my flow of cash and awareness of my important connections. Choosing a CRM system was quite stressful, these are big decisions due to the effort in learning and the longevity of the choice you make. 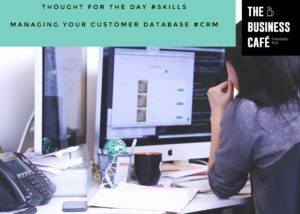 If you don’t have a CRM system in place that you are using as a daily discipline, then I hope we can all help you in this conversation. My criteria – I wanted it to be good on my mobile, hold all my notes about meetings and emails and critically be able to tag the different types of connections, the stakeholders I have created around the core business concept. Being able to tag all the connections by type so I can search and send the right message to the differing tags- the suppliers, advocates, influences, networks, government, and sponsors etc. My priority was not an e-mailing system, in fact, we export my CRM names into Mailchimp for the process of mailings. I use Insightly for my own use, working with it daily, following up people, adding new connections and always tagging them. The systems we have in place for our business are so important to enable our productivity to grow. They can be a real pain to learn, very hard to chose which is best and then the daily discipline of maintaining them. This is not easy when focused on the here-and-now of selling and servicing clients. Can anyone throw any of his or her thoughts in this conversation. Any questions to see if we can all help, advice from your own lessons and research?